GOVERNOR OF ASSAM FELICITATES MASTER SHAHIL DEY! 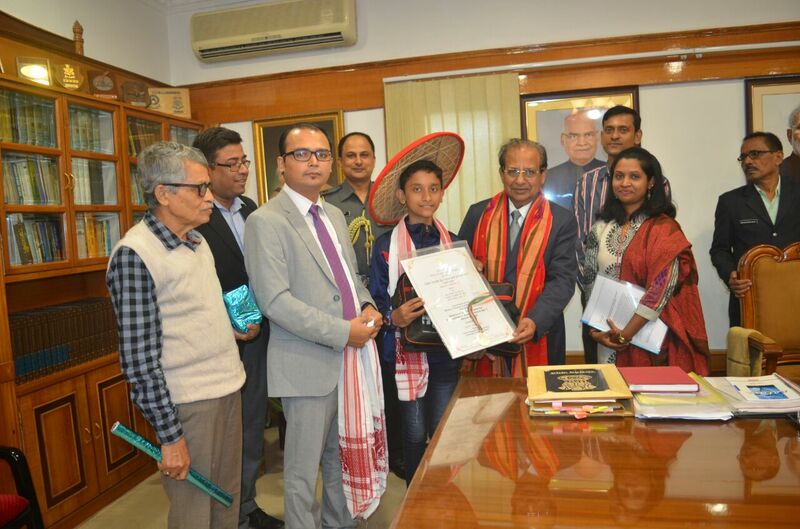 Master Shahil Dey, a student of Assam Chess Club, an unit of Akshayam who recently received the "National Award for Excellence in Sports" from the President of India, was invited to Raj Bhawan on 6th December 2017 by the Governor of Assam, His Excellency Sri Jagdish Mukhi. A delegate of Akshayam comprising Secretary Sri Biswajit Bharadwaj, Treasurer Sri Kumud Chandra Bhattacharyya, Member Bishov Lal Pathak along with Shahil and his parent met the Governor and feliciated him and also presented him a Chess Set. The honourable Governor appreciated the achievement of Shahil and the support provided by Akshayam and Assam Chess Club and assured his full support and cooperation to Shahil in the future. The Governor also feliciated Master Shahil with a Gamocha and Japi and presented him a chess Set as well and wished him success in the future.